Grooms face and sniffs air. Players can loot the pet from this rare spawn only once per character. Instantly deals 236 Beast damage and causes the target to Bleed for 98 additional Beast damage per round for 4 rounds. 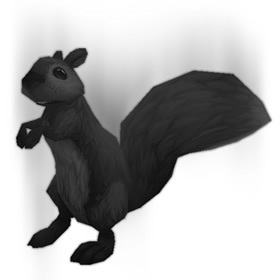 Hurls nuts at the enemy, dealing 531 Critter damage. Strongest squirrel out there. Only one with a power > 300 ! This is an amazing pet, powerhouse for pve and the damage reduction + dot+speed and damage with burn is a total killer. This pet has the potential to allow the attacker to choose what sort of DOT to burst damage they need. Is the target pet Elemental or a Critter? Choose either Maul\Blood in the Water or Conflagrate or Deepburn. This also allows you to set up your incoming pet's speeds and racial benefits.